The September 23, 1927 issue of The Film Daily carried news that the Skouras Brothers and Harry Koplar were close to opening a major theater in south St. Louis. Indeed, the Skouras Brothers’ St. Louis Amusement Company was preparing to break ground on the 1,585-seat Granada Theatre on Gravois Avenue. 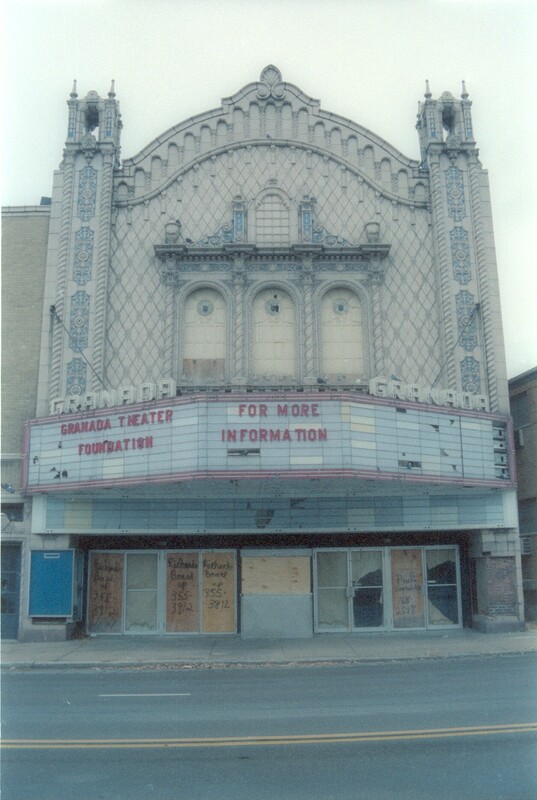 The Granada Theatre opened on October 1, 1927 as the south side flagship of the Skouras Brothers. The theater showed first-run motion pictures with floor shows and orchestral performances until 1930. Eventually the Arthur Brothers purchased the St. Louis Amusement Company. The Skouras Brothers contracted design and construction to Chicago-based R. Levine & Co., which placed design in the care of architect E.P. Ruppert. Ruppert designed a lavishly-detailed terra cotta face, modern air-conditioned auditorium and flanking income-producing mixed-use buildings that still stand. The building permit, issued on November 7, 1925, stated that the cost of building the theater alone was $350,000, with the adjacent buildings costing $225,000 to build. The substantial investment created one of Gravois Boulevard’s most memorable works of architecture, which the city wrecked in 1992 after years of neglect. Ruppert’s design employed stylistic details appropriated from Spanish Baroque architecture, including twin towers flanking a rounded parapet top. Above the marquee, a central window assembly featured braided pilasters and an attenuated form with decorative urns at each end. The entire front elevation was made from polychromatic terra cotta. 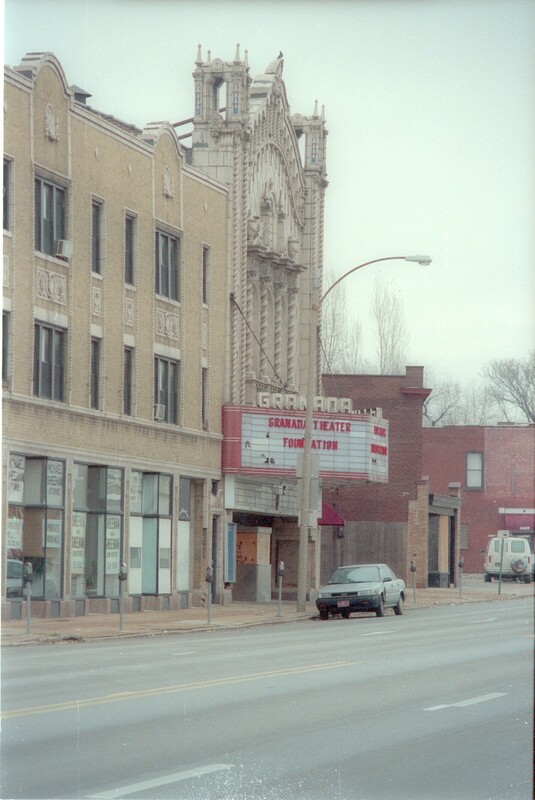 The exotic style and detailing of the Granada today can only be seen in the St. Louis area in the smaller, contemporary Majestic Theater (1927; Boller Brothers, architect) in downtown East St. Louis, Illinois. Architect Ruppert’s works are not widely documented, but his practice includes several Midwestern movie theaters across the 1920s and 1930s. Ruppert left solo practice to work for prolific theater builder Rubin Levine’s R. Levine & Co. R. Levine & Co. perfected a design/build model serving chains like the Skouras Brothers’, and employed architect W.P. Whitney as well as Ruppert. In 1926, R. Levine & Co. reported in Motion Picture News that the company was building 27 theaters that year. The 1926 output included six in St. Louis, including the Granada, nine in Chicago, and two in Toledo, reinforcing the regional nature of Levine’s practice. Two years before, R. Levine & Co. had completed the now-demolished 1,780-seat Washington Theater in Granite City, Illinois. Ruppert’s known designs include the extant Washington Theater (1924) in Quincy, Illinois and Liberty Theater (1937) in Libertyville, Illinois, as well as the demolished Orpheum Theater in Springfield, Illinois, Tivoli Theater (1925) in Mishawaka, Indiana, and Midwest Theater in Chicago, Illinois. Ruppert designed an Elks Club (1919) as well as apartment and commercial buildings across Chicago and its inner suburbs.